I posted this recent make yesterday and a couple of nice folk have asked me how I stamped the Banana Frog planet in the different colours. I thought the easiest way would be to show you! Little spray bottle filled with water. I’ve used three inks in the pink/purple range using the Opera Pink as my lightest colour and Grape as my darkest colour, with Amethyst in the middle. This technique works with all sorts of different colour matches so play around with the inks you have to find your favourites. Decide which side of the stamp will be the lightest and which the darkest. Then start to ink your stamp with your lightest colour on the ‘light’ side of the stamp. I use gentle tapping of the ink pad on the stamp, better to put on too little rather than too much ink, you can always reapply as needed. I pretty much cover the ‘light’ side and the middle of my stamp with the Opera Pink, making sure I get good pink coverage on the ‘light’ side. I then use my middle colour, Amethyst, on the middle of the stamp, being careful not to leave any straight lines caused by the ink pad edge. If you need to diffuse any lines or marks then you can always reapply a little of the lighter colour to blend it in. 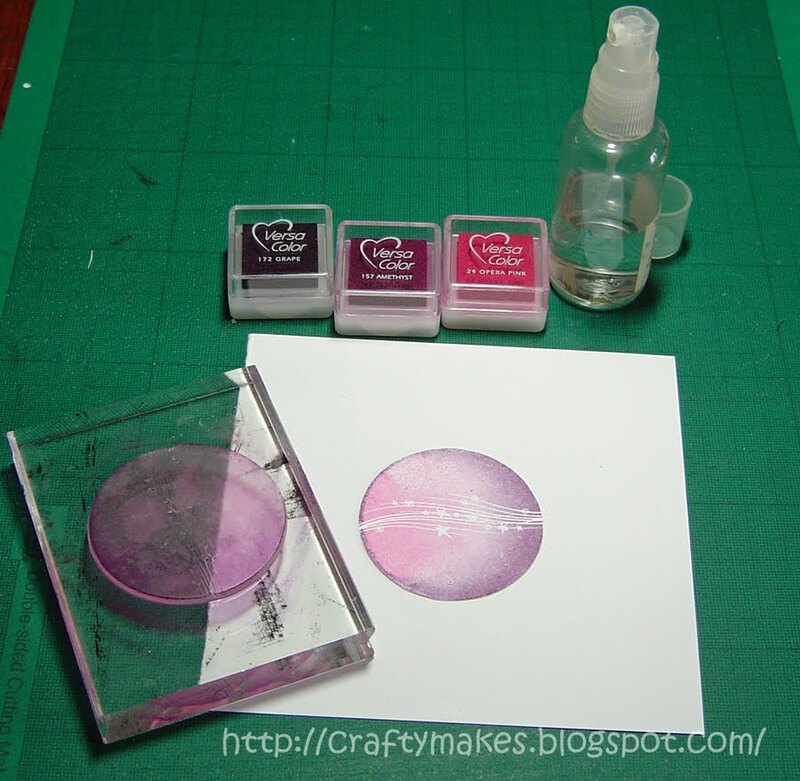 Apply your darkest colour, Grape, to the ‘dark’ side of the stamp, again if you need to diffuse or blend the colour you can always add a bit more of the middle colour. I then very lightly go all around the edge of this stamp with the Grape colour to get the edge differentiation, you don’t have to, I just like it on this stamp. This is the crucial bit! 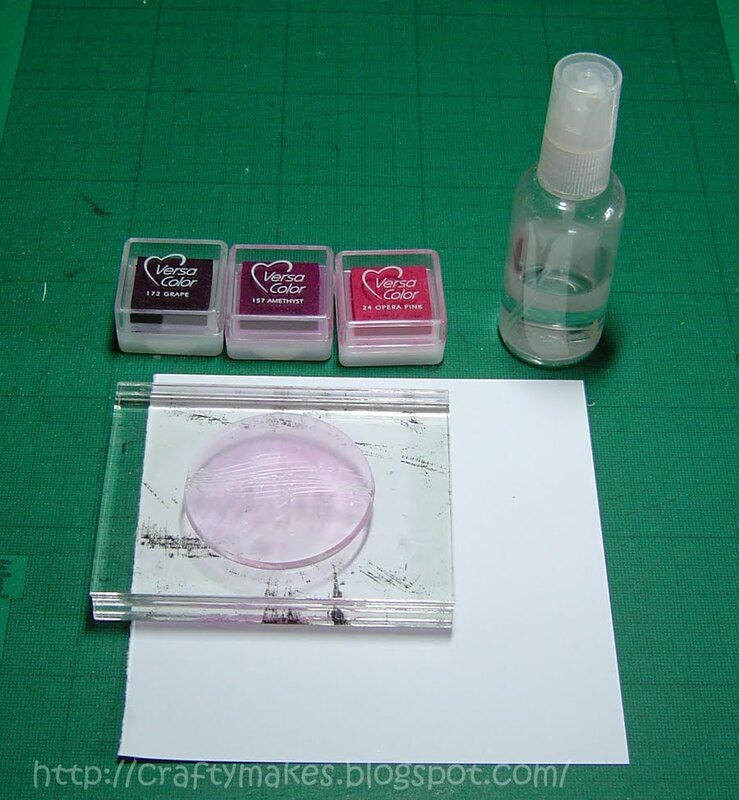 Lightly spray your stamp, this requires a bit of trial and error to know what is the right amount of water for the effect you want, so don’t worry if you have to repeat the whole process – it is all part of the fun! 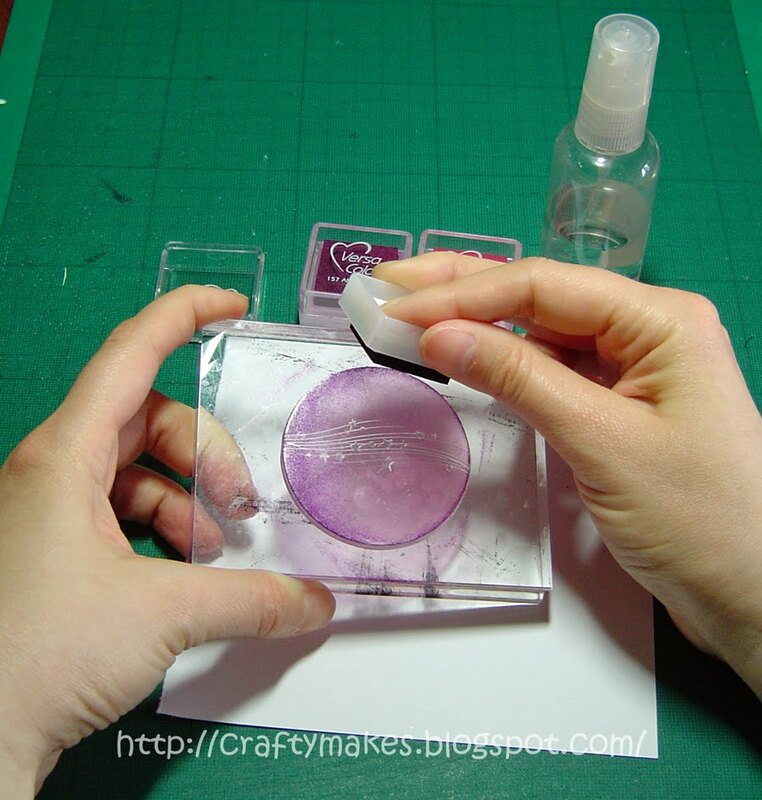 For me I like to have the bottle at least 8 cm (~3 inch) away from the stamp and I hold the both the stamp and the spray bottle upright so the spray is nice and fine and you are less likely to get any spitting or drops on the stamp. For this lightly water coloured effect I only gave it one spray, but it all depends on your spray bottle! 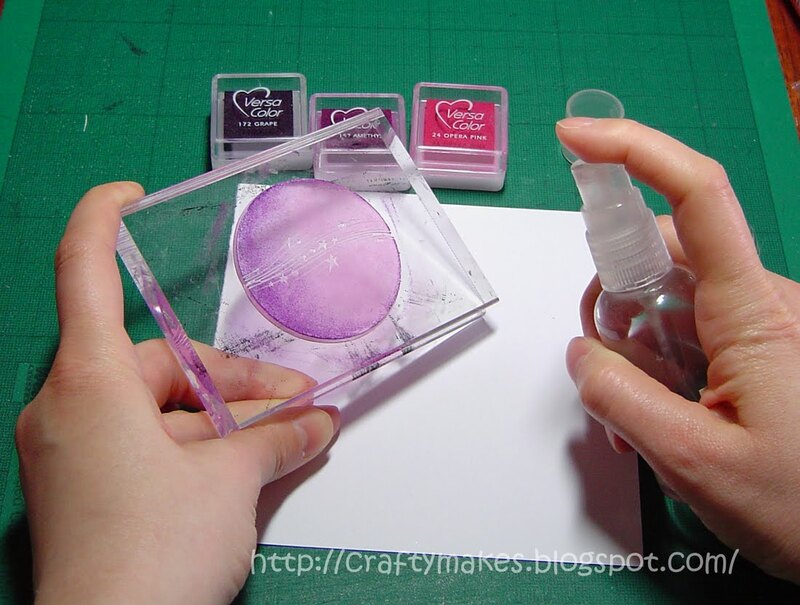 This is a wonderful technique to play with on all sorts of different stamps. It works beautifully on your ‘block’ stamps like this one, where a lot of colour is needed but it also works well on your ‘line’ stamps where there is more details. Get one of your flower image stamps out and have a go! Wow!! This is so smart!! I am so going to try this out! brilliant kim… thanks 4 sharing this with us all….. what a fab idea… and what a brill card… i just love everythink about it…!!!! gorgeous colors! love your beautiful shaped card!! thanks for the tutorial, too! Oh that looks awesome Kim! Thanks for this tutorial. Another technique to have a play with. Thanks for sharing, I'll have a go. 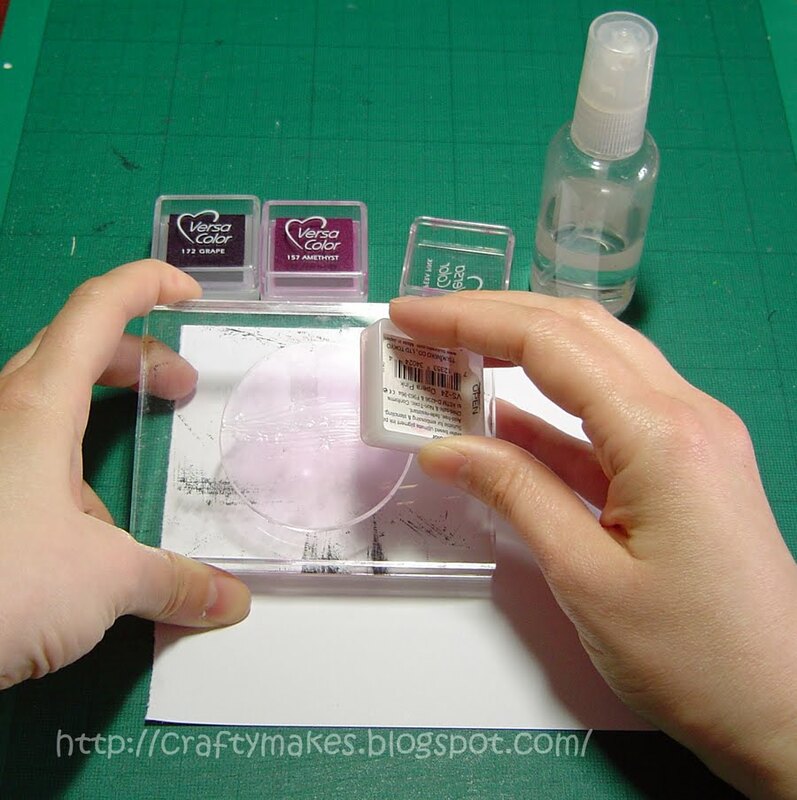 thanks for sharing this clear tutorial Kim! Brilliant tut Kim… love the effect…thanks for sharing. Oh wow! Thank you for this tutorial Kim…This is just magnificent…I love how the colors blended so perfectly! You have taught me that it is okay to buy these little things of ink…For some reason I always buy the big stamp pads…not any more!! !